Lavender comes from the Latin word "lavare," meaning “to wash.” Lavender ranges in color from bright indigo to a subdued white violet and has a strong sweet green scent. Lavender has been used throughout the centuries as an antiseptic, bathing agent and calming agent. It is known for its anti-inflammatory characteristics and its ability to dilate blood vessels, which suggests why it helps reduce headache pain. Lavender is used for many purposes today, including insomnia, eczema, arthritis, cuts, inflammation, hair loss, stress, anxiety, fungus, bacteria, sinus congestion, irritability, cooking, migraines and headaches. There are no specific studies that confirm the benefits of lavender oil in helping headaches. Essential oils are not governed by the Food and Drug Administration (FDA); therefore, one should exercise caution when using the oils to treat headaches. However, there is much anecdotal evidence that supports the idea that lavender oil can ease headache pain. Others have suggested, however, that the strong smell of lavender has actually caused them to experience headache symptoms. This is due to a possible allergic reaction that can accompany the use of lavender oil. Coumarin compounds are found in small part in lavender. The function of these compounds is to aid in opening up or dilating blood vessels, which helps to reduce headache pain. On method of using lavender oil is to put two to three drops of lavender oil in 3 cups of boiling water over the stove, carefully lean over the pot, and inhale the steam. Another method used to overcome a headache is to put put two to three drops of lavender oil in a cup of cold water. Drop a washcloth into the water then wring it out. Lie down and place the cool cloth on the forehead or the back of the neck. If a warm compress is preferred simply do the same thing only in a cup of warm water. A drop of lavender oil may be placed directly on the temples or base of neck to give relief. 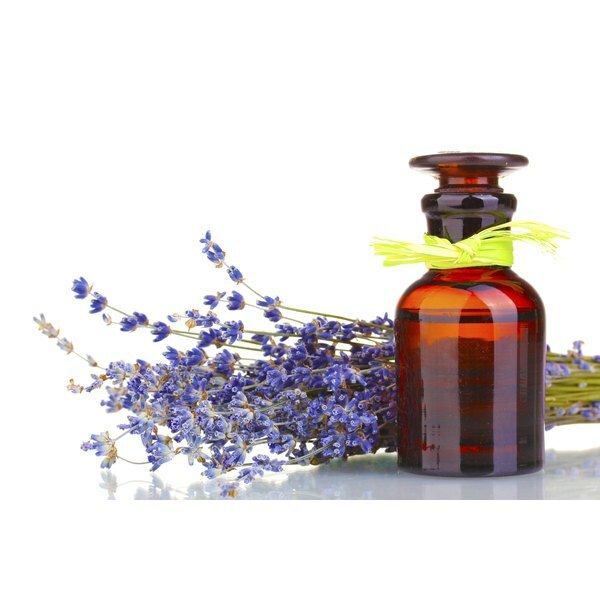 Lavender oil is toxic when taken internally. Breast-feeding and pregnant women are advised to avoid using lavender. Some individuals have experienced allergic reactions after inhaling or absorbing lavender. The symptoms included vomiting, chills, nausea and headaches. There are not any known interactions of lavender with medications at this time. There is, however, a possibility of lavender strengthening the effects of central nervous depressants. Check with a physician before taking lavender if using any type of depressant or pain killer. Carri Ward has been working in the health and fitness industry since 1997. She graduated from the University of Utah in exercise and sport science and holds an NSCA-CSCS certification. She has 10 years' experience as a personal trainer. She is the founder and president of a youth-serving nonprofit organization.